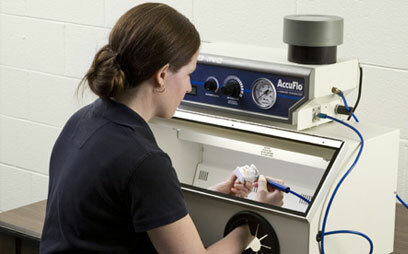 A workstation is essential to any MicroBlasting application. 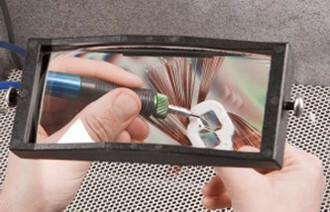 It confines the abrasive, illuminates the work area and provides adequate airflow for dust removal. 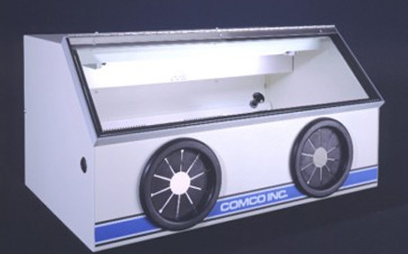 Comco offers a variety of workstations to handle everything from miniature precision components, to circuit boards, to stainless tubes up to one meter long. 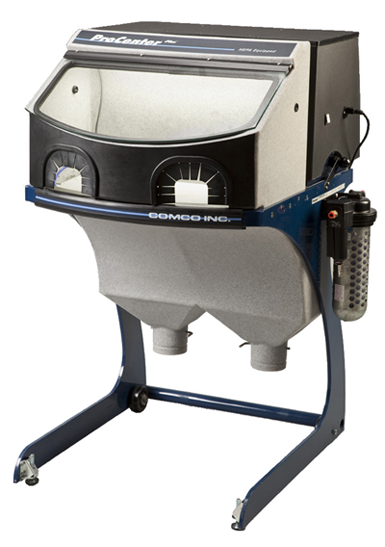 The ProCenter Plus creates a clean, comfortable work environment with great visibility to optimize the effectiveness of your MicroBlasting application. It is the perfect complement to any of our blasters for manual or fixtured applications. 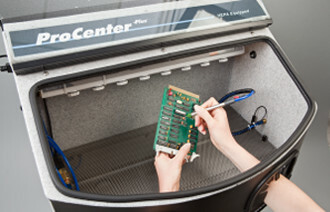 What makes the ProCenter ideal for most production environments? The compact and ergonomic ClearView Workstation features large padded iris openings set at an angle. Its recessed lighting and efficient airflow design keep the interior bright and clean. 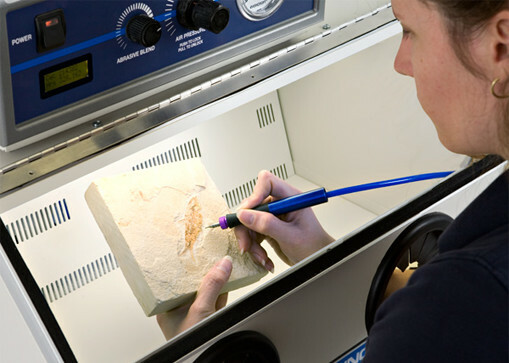 The Classic Workstation provides a spacious work area ideal for fixturing. Illuminated by dual 18″ fluorescent lamps, the Classic features a sloped window for maximum visibility and reduced glare. The iris access openings in the front of the unit are designed for operator comfort and easy movement within the chamber. Need a bigger box or wider door? We can build a custom workstation to handle your special requirements. Our custom workstations provide all the superior design features of a Classic Workstation, but in larger sizes. Custom door openings facilitate processing of large parts or large trays of smaller parts. Interested in a Big Box or custom design? *Big Box specifications only. 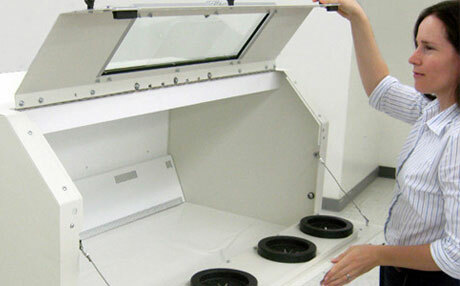 Custom workstations can be fabricated to meet the needs of the application. Dissipate static charges that build up on a part during blasting with a flow of ionized air. 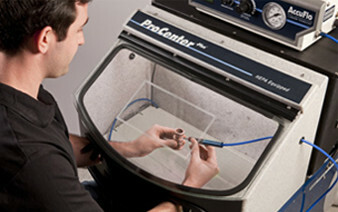 The ESD Control option is only available on the ProCenter Plus™. 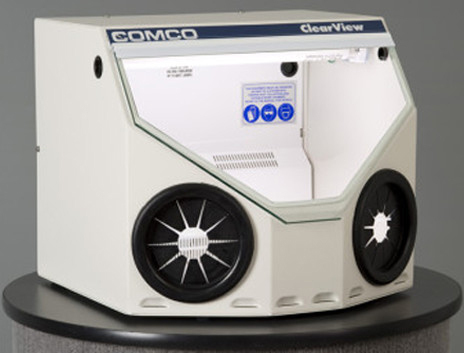 Protect your eyes with this magnifier that easily attaches to any Comco workstation. Provides 2.5x magnification and features a wide field of focus. Extend the life of your workstation’s viewing window by protecting the inside of the glass from damage caused by abrasive ricochet.